An emblematic map of the world has loomed large in modern productions of Tamburlaine and assumed major importance in the famous 1951 Old Vic production, which was directed by Tyrone Guthrie and starred Donald Wolfit. This was also an abridged version and played for five weeks at the Old Vic in London and one week at Stratford-upon-Avon. It was then revived in 1956 with Anthony Quayle in the title role and played for two successful weeks in Toronto; it concluded with a short, unsuccessful run in New York City. 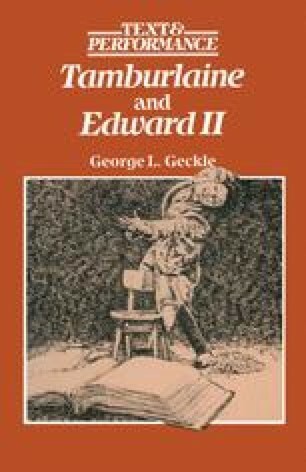 The Guthrie-Wolfit abridgement, published by William Heinemann in 1951, is in all respects a better version of Tamburlaine than the one by Benét-Woolley. Interestingly, Guthrie-Wolfit cut many of the same lines as their predecessors and also some of the same minor characters. Both versions cut out the roles of Ceneus and Magnetes in Part I and those of Gazellus, Uribassa, Sigismund, Frederick, Baldwin, and the Captain of Balsera, Olympia, and their son in Part II. The evidence leads to the conclusion that Guthrie-Wolfit may have known the 1919 Yale version. Even if they did not, it is interesting that as practical men of the theatre they thought along lines similar to those of Benét-Woolley.